I listen to music constantly. Work, eat, workout, play — these are some songs that have been traveling with me through December. What songs have been getting you through your month? When this question was asked in a small room of mostly white birth workers in my city, the room fell quiet. And then — I can’t remember if someone literally asked, “Is it different for Black birth workers?” Or not — or maybe in other words — but I know the bit of conversation that followed made it clear that this question just hadn’t really occurred to many people before. And now, I have this awful feeling that I’m a broken record, but if I am… it’s not because I’m broken it’s because the broken things I’m talking about still haven’t healed. And the NY Doula Medicaid ordeal is a prime example of that truth. Because once I looked into it, it became incredibly clear to me that this initiative is more about lip service to a buzzing topic than actually delivering consistent and quality support to the folks it’s claiming to — and will, beyond that, do a disservice to the folks who support them. According to the New York State Doula Pilot Program webpage, doulas will be reimbursed $30 per prenatal visit, $300 per birth attended, and $30 per postpartum visit. Why? Alright. So let’s go ahead and think about this. The average rent for a one-bedroom in New York City is $3,100. The average spent on utilities in the U.S. generally (couldn’t find it for NY specifically) is $211. Average on food is $317. Transportation, $211. Entertainment, $106. Clothing, $106. Insurance and other misc costs, $106 (which is ridiculously low). Let’s pretend this doula has no debt. Let’s say they’re just trying to set aside $100 a month for emergency savings. Total: $4257 a month for one doula, living alone with no child or partner, (and certainly not also pursuing midwifery school or certification). The NY Doula Pilot Program page estimates 7 visits and one labor and delivery visit per doula client, a total of $510 per doula client (also note that 2-3 prenatal visits, labor support, and one postpartum visit are standard for most doulas). It will not only impact Black birth workers but it will largely impact Black birth workers since many do have and will continue to have clients on Medicaid. Alright let’s say they have a part-time job — 20 hours a week, $12/hr (min wage in NY is $10.40/hr). Not only that, they’d need to specifically have a part-time job with a boss who’s willing to be flexible with them when they get called to a birth during their shift hours — who won’t just fire them — and because inevitably they’re going to have some overlap between working hours and labors — it’s incredibly unlikely they’d even make the full $960 a month. Now let’s say they take one client a month who can pay $1200 (about the average cost of a doula). They’d need to make $3,057 more. AND, let’s acknowledge the cost of time we’re talking about here. Because you know this doula is going to have to take time to process all the paperwork for all of these clients, and pay for postage or whatever to submit them, and wait for reimbursement to be processed and allotted to them. Black and POC birth workers are already fundraising to the ends of the earth to support our work. We ask for funds straight up, we offer little rewards, we turn to fun slogan t-shirts — we’ve been doing this. In fact, we’re already working multiple jobs, too — trying to juggle clients who are able to pay more and those who are not able to pay as much, too — living with roommates to reduce costs, applying for scholarships, dipping into savings, living without certain things, leaning on friends and family, etc. And all the while that we do these things, we experience discrimination just like our clients do — day to day in normal life, and in the birth world, too — whether because unconscious or conscious bias based on the color of our skin or because of distaste for / misunderstandings of our roles as support people or all of the above. And by our peers we are asked to explain (“Can you teach me about…”), solve (“Tell me what I need to do…”) and not to talk about (“Why does race have to be brought into everything?”) the inequities that we face. It is more than a little frustrating. It is literally adding insult to injury to create a system to support a group of people that cannot support the support persons themselves. Payment from a program like this and payment directly from a client — that’s a horse of a different color. Is a response like mine actually ungrateful, or holding a capable authority to a reasonable standard? Birth work is a job. Birth workers are doing a job. A job with expenses we must pay to perform it properly. A job that takes a physical toll on our bodies, and an emotional toll on our beings. A job that sometimes requires that we remain as a continuous support person for 10, 12, 16, 24+ hours. Yes, it’s a beautiful job that we feel called to and incredibly honored to do… and it’s so impactful that many of us are WILLING to make sacrifices to do it — but that does not mean we shouldn’t expect to be able to sustain our own lives through it. And I’m not saying that I don’t think folks should participate in this pilot program, or that it shouldn’t exist at all. I hope that many people do participate and find ways to make it work for them, and advocate for improvements that would make it better. But I have a very real concern that there’s no intent to improve it — that in fact, people somewhere are patting themselves on the back for what they’ve created — a system that perpetuates the “Strong Black Woman” trope by making “Strong Black Birth Workers” who must make due with the little allotted to us on top of the regular set of stressors we continue to have. Nothing would make me happier than to be proven wrong on that. Because to be honest, I’m not interested in the “Strong Black Birth Worker” blue ribbon for myself or anyone else. I want safety, support, joy and empowerment. As we stand in the gap for those who are bringing new life into the world, I want birth workers to be able to have full lives of our own. *This doesn’t justify the payment of the doula, it just means that OB/GYNs and midwives are also being underpaid and done a disservice when they’re reimbursed by Medicaid, too. **None of this began to address taxes. 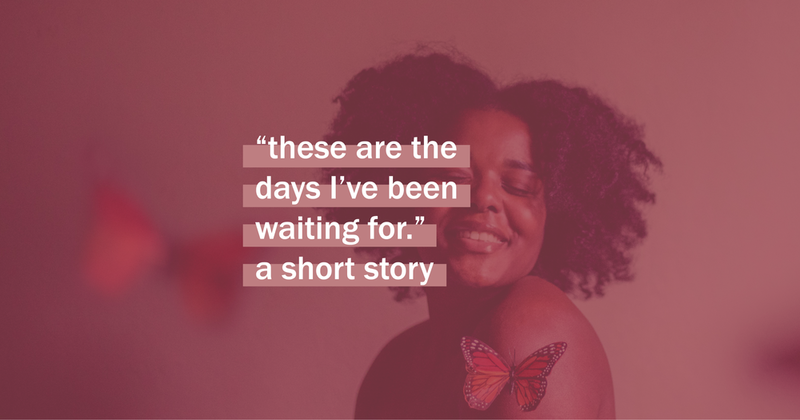 “These are the days I’ve been waiting for,” she said to herself, looking at half of her face in the bathroom mirror as the other half leaned against the door frame. Nevermind that she has no idea what that really means. It was a statement of sentiment more than of fact, because facts have no place in a moment like that. A moment when time doesn’t cease but just ceases to matter. Arbitrary. Like whatever her neighbor is doing upstairs or whoever is passing on the sidewalk outside of her view — it simply isn’t relevant to where she is right then. She still wants that warm feeling, though… even though she knows from time and time again of past experience, it always trails away and into other days with a much different face looking back at her in the bathroom mirror. But that’s the thing. When the thick, cold, low day comes — or the angry, bright, heavy day falls — or the bitter, dark, tangled day looms — she’ll need this one — this moment — the memory of the full, warm glow that comes from somewhere she doesn’t even know the name of. That sweeps over from the inside. That winds out widely in every direction. It won’t destroy her hardships altogether… but it’ll take the edge off, remind her there is another side — that she knows, too. She rubs her eyes, tired. The moment passed. And within the hour, she falls asleep. About a month ago, I had the immense pleasure of being interviewed for The Dream Differed Podcast. Now, let me set the scene for you. This was a breakfast interview — a whole breakfast. Waffles made in front of me, bacon, mimosas — just, mm. Hosts Christian and Cayman must’ve known something about me when they planned this. Total strangers only moments before, they had me warmed up and gabbing for well over an hour with ease. But seriously, Christian and Cayman’s questions stirred up some incredibly significant reflections for me — including the topic of todays’ blog post. As December begins, I’m looking back on two years of self-employment. Two years of not always knowing month to month where my income is going to come from or how much it is going to be. Why? I needed my work AND my life to be valued. And I needed the lessons and sensitivities of my life’s experience to have a tangible impact and role in my work. I needed this partly for me — to feed my own soul, which surely gets weary in the workplace when I feel undervalued and silenced — but also because I was seeing that it had DIRECT impact on the outcomes of my work, which had to do with the quality and direction of peoples’ individual and communal lives! I haven’t innately changed. The way I work hasn’t really changed either. When I was working for someone else, I was still just as genuine and hardworking as I am now. I still cared for the people I worked with and near the same way I care for folks now. I still pulled long hours and did things from a place of passion. But I didn’t have the power or the influence to be sure that my own good intentions weren’t being… overshadowed or undermined or maybe even upended entirely… by systematic flaws. Now, to this point it sounds like I’m saying the opposite of this blog post’s title, and — yes that’s sort of true. 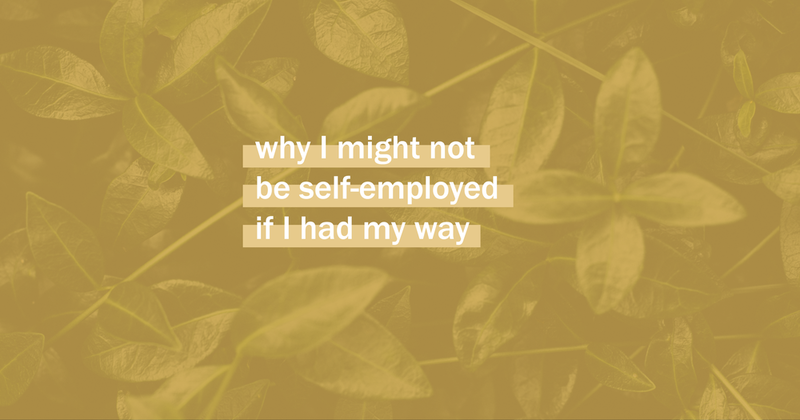 Unless I come to a point where I understand that practically, I need to put my self-employment to the side in order to sustain my life — I’m likely going to stay self-employed. But… in an ideal world, if I had my way, I wouldn’t have those concerns I expressed to Christian and Cayman. In an ideal world I never would have felt like I had to go my own way to provide the kind of support I would want to be provided if the tables turned. If in this world, I ever find a place that proposed to hire me full-time and met those qualifications, I’d absolutely entertain the option. How Do You Solve a Problem Like Work/Life Balance? I listen to music constantly. Work, eat, workout, play — these are some songs that have been traveling with me through November. What songs have been getting you through your month?